Free shipping. Buy direct from HP. 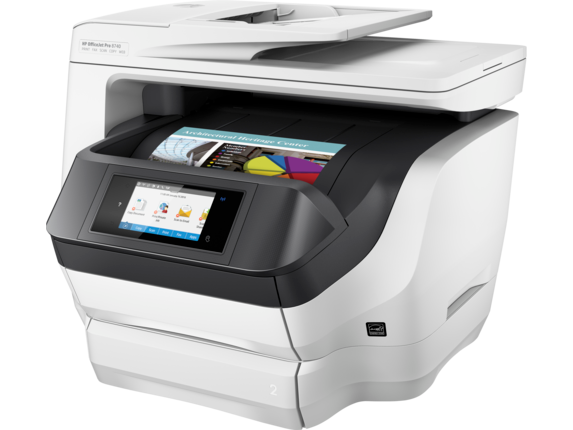 See customer reviews and comparisons for the HP OfficeJet Pro 8740 All-in-One Printer. Upgrades and savings on select products. Maximize your print environment with space-saving HP Print Forward Design and professional-quality, low-cost color. Help reduce costs with fleet management solutions. Stay productive with an all-in-one designed for high-volume enterprises. Ideal for small workgroups who need affordable, professional-quality color with fleet management capabilities, all in a space-saving design. Speed through print jobs, using superfast two-sided printing. Breeze through multipage documents with one-pass two-sided scanning and a 50-page automatic document feeder.Revolutionary design delivers laser-like paper handling and superfast print speeds.Increase paper capacity to 500 sheets with the included second 250-sheet paper tray. Manage your budget with professional-quality color at up to 50% less cost per page than lasers.Save up to 50% on ink and never run out. Print color or black-and-white for the same low price.Professional-quality prints for up to 50% less per page. Save even more with HP Instant Ink.Print up to 3x as many pages with optional Original HP high-yield ink cartridges. Speed through print jobs, using superfast two-sided printing.Breeze through multipage documents with one-pass two-sided scanning and a 50-page automatic document feeder.Revolutionary design delivers laser-like paper handling and superfast print speeds.Increase paper capacity to 500 sheets with the included second 250-sheet paper tray. Print with just a touch of your NFC-enabled mobile device to the printer—no company network needed.Print directly from your mobile device without accessing the company network, from anywhere in the office.Easily print from a variety of smartphones and tablets.Help protect information and access to confidential print jobs with HP JetAdvantage Private Print. Get increased printing options with HP PCL 6, HP PCL 5c, HP PS, and scalable TrueType fonts.Easily print Microsoft® Word and PowerPoint® files, plus Adobe® PDF files, directly from your USB drive.Experience a new style of business printing and imaging, with HP JetAdvantage On Demand solutions.Easily take command of your printing environment from one central location, with HP Web Jetadmin. 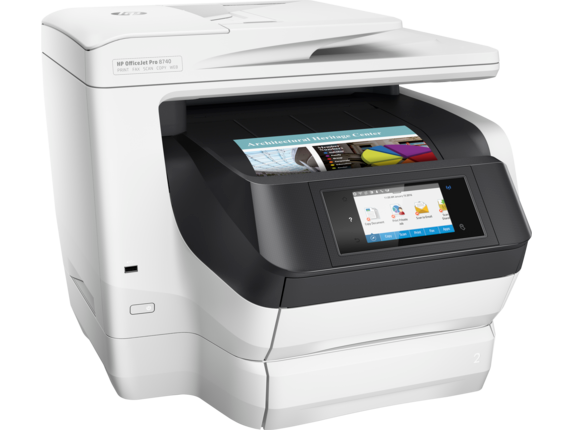 With an accessible price point and high-speed multifunction printing, the HP OfficeJet Pro 8740 is a robust all-in-one printer suited to small offices and busy professionals. It’s a great option for when it’s time to upgrade from a lesser device and when you need to reduce the clutter associated with having separate devices occupying your workspace. For prints, you’ll achieve speeds of up to 24 pages per minute (ppm) in black ink and 20 ppm with color, and at draft settings you can expect as many as 36 pages in either format. You won’t be waiting around when using duplex printing settings either, because double-sided print speeds reach up to 20 ppm. It’s also set up for easy fleet management and features high capacity trays, including two standard input trays holding a total of 500 sheets and an output tray that can handle up to 150 sheets. Print wirelessly from your smartphone or tablet from anywhere in your office, and cut back on time-consuming transfers by printing via USB. 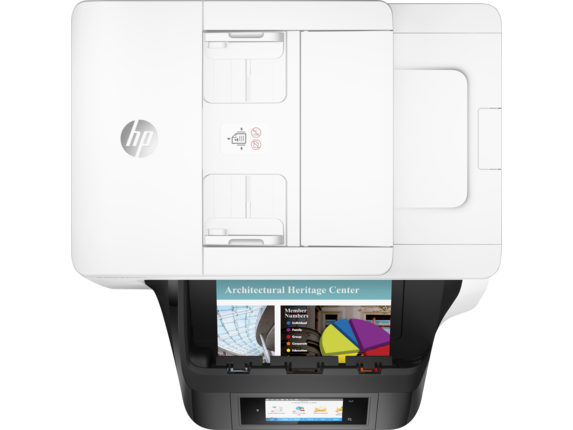 Just download the HP Smart app and start printing wirelessly. 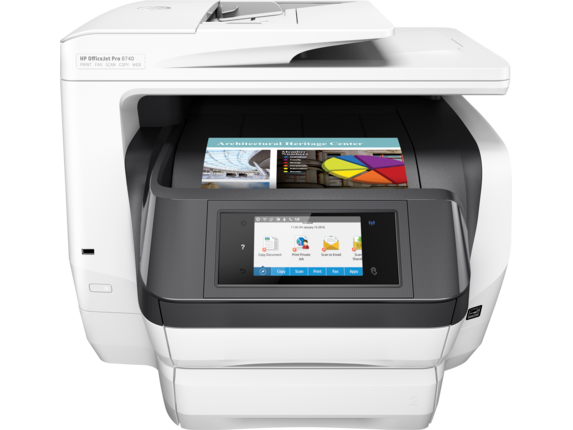 The HP 8740 also boasts high security wireless features like HP JetAdvantage Private Print for simple management of confidential prints. Are you tired of constantly replacing cartridges or how often you need to keep tabs on your ink level? The next time you’re running low on ink, stock up with an HP 952XL High Yield Black Original ink cartridge. They’re good for up to 2,000 pages, which is up to twice as many pages as standard cartridges. Or, if you want to get the best possible savings and cut out just about all the hassle of a typical print supply routine, consider the convenient and money-saving HP Instant Ink subscription service. After purchasing an HP Instant Ink-enabled printer, all you have to do is select your preferred plan from the four available tiers, with each price based on expected print volume rather than ink use. That means color prints cost you no more than black and white, so there’s no need to hold back. For infrequent printers, HP Instant Ink opens with a free plan offering 15 pages a month, or if you’re expecting a steadier flow of print projects, it tops out with a 300 pages per month plan at $9.99 with each additional 20 pages costing only $1. And when you’re low on ink, your printer will automatically have a new cartridge shipped right to your door. We’ll even recycle your spent cartridges for you, with no extra shipping costs. If you want to shift more of your photo routine away from third-party services and into your office, you can achieve professional-grade, high-resolution color prints with your HP 8740. And it’s easier than you may imagine. Just check out our FSC-certified mixed fiber HP Premium Plus glossy photo paper, which is sourced responsibly from managed forests. When you use the right supplies, you can turn your HP OfficeJet Pro 8740 into a photo hub to meet your hobby or business needs.